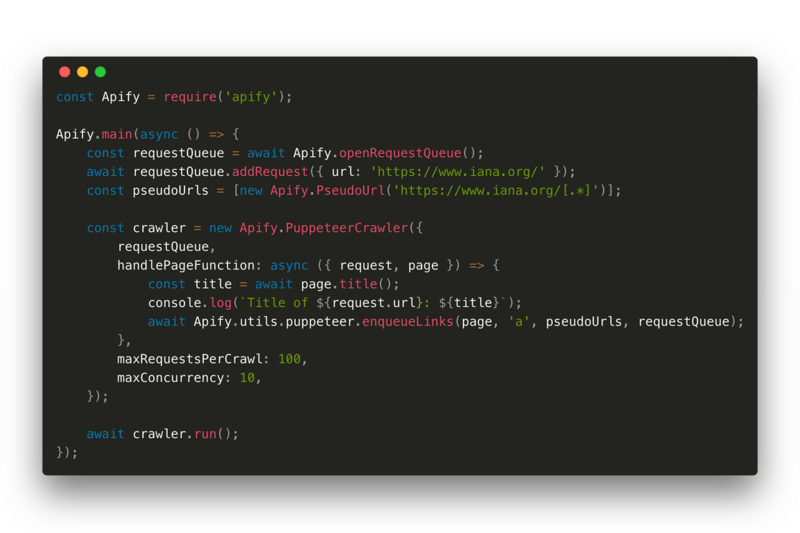 Run headless Chrome or Selenium, manage lists and queues of URLs to crawl, run crawlers in parallel at maximum system capacity. Handle storage and export of results and rotate proxies. All the crawlers are automatically scaled based on available system resources using the AutoscaledPool class. When you run your code on the Apify Cloud, you can also take advantage of a pool of proxies to avoid detection. For data storage, you can use the Dataset, KeyValueStore and RequestQueue classes. Install Apify SDK into a Node.js project. You must have Node.js 8 or higher installed. Execute the following command in the project's folder and watch it recursively crawl IANA with Puppeteer and Chromium.